While it's true that kids can be introduced to the game at any age (in fact, the younger you start, the better), children who are grade-school age and below don't always have the patience or attention span to play multiple holes. So what's a golf-loving parent to do when he or she is jonesing for a quick nine? Bring the kids along, of course! 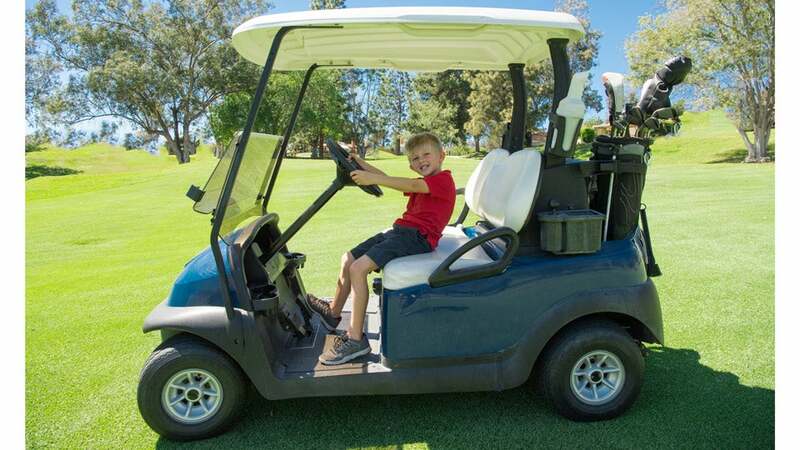 Here are seven ways to keep your little humans entertained in the golf cart and on the course while you get your game on. If your son or daughter wants to join you on the course but they clearly aren't ready to hit shots, try introducing them in stages. Invite them to take a swing without a ball on the tee. Then, move on to a putt or two on the green. If that goes well, you can try longer putts, chips and pitches, and shots inside of 100 yards. Eventually, you can let them tee it up from the fairway and play the second half of the hole with you. Kids love to complete assigmments and tasks, so why not put that desire to please to good use? See if your little one likes holding the flag, fixing divots on the green, raking bunkers, marking your ball, grabbing the ball from the hole, or even cleaning your clubs and/or ball. Not only are they absorbing proper course etiquette, but mom and dad can take a break from all that bending and save those aching backs for a while. For younger kids, "I Spy" is a great way to keep them engaged with their surroundings — especially when there is so much to see on a golf course. Try coming up with a new category on every hole: "I spy five birds." "I spy three things that start with 'T.'" Or, you can simply make a list of things for them to look for during round, like sand, water, flowers, animals and trees. Make sure to share their enthusiasm when they report their findings. Allow your child to exercise their budding penmanship and counting skills by appointing them scorekeeper. You can make them feel extra-special by bringing a pre-selected pen or pencil from home for them to use, and maybe even a designated hat or pin for them to wear to the course. Ask your child to help you count your strokes after each hole, and show them where to jot the numbers down on the card. If my 21-month-old daughter's interests are any indication, toddlers love to sort things and eat snacks. (Don't we all? Well, at least the latter.) Kill two birds with one stone by bringing three or four of your child's favorite snacks — goldfish, pretzels, cookies, anything! — and ask your child to mix them into a big plastic bag. (You can also work backwards, and pre-mix the snacks beforehand so they can the be sorted into smaller bags.) Not only can stop those hunger whines before they start, but you can also get at least one hole's worth of peace with this activity. Another way to capitalize on your child's love of sorting is to ask them to organize your golf bag. Empty the pockets of all their contents before the round and then ask that everything be put back with its "friends" — i.e., matching items: gloves with gloves, tees with tees, balls with balls, and so on. Now there's a win-win! Occupied child, and tidy bag. Check and check. Pack some coloring books and regular books to read in the cart in an effort to avoid resorting to a phone or tablet. One of golf's greatest allures is spending time in the fresh air of the of the great outdoors, away from the onslaught of technology. With that said, every modern parent knows that it's always worthwhile to have your phone or a tablet handy, just in case an unexpected tantrum comes calling. So if all else fails, don't be ashamed to bust out the screen for some cartoon entertainment. With any luck, your round will be nearly complete by then.